Tired of sticky labels gumming up your office furniture and walls? Does writing on the office communication board make your hand cramp? Take control of any flat, clean surface—with StoreSMART's Window Frame Style Velcro Document Holders! 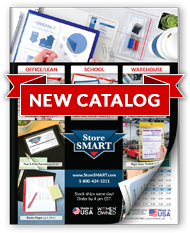 This convenient 2 ¾" x 11" size is perfect for labeling filing cabinets, metal doors, warehouse shelves, and titling visual management displays. Each holder is open on the long side to make swapping paper labels a breeze, and designed to frame your content with an attractive ½" border. The reusable adhesive strips allow you to stick these holders almost anywhere. Color-code your information to bolster employee comprehension, or utilize a variety of shades to bring a touch of color to your next meeting. Two ¾" x 11" Velcro strips on the back—both hook and loop sides. The exterior half of each strip is coated with a permanent adhesive. Peel & Stick Flash Drive Pocket with Flap - 2" x 2"